I am finally back with my final tattoo collection. It's been almost two months since I posted part 5 and I don't know why it's taken me this long to make this final post. I think maybe it has to do with me being a little sad that this series is coming to an end and I had so much fun doing it! This post is going to consist of tattoos that have been done by Chelsey the newest tattoo artist I have been going to for my work. First I want to start off by sharing how I came to finding her. I love Disney you all know this by now, I love seeing all kinds of Disney tattoos since I have a few myself. One of my good friends Sami had tagged me on a photo of a Disney tattoo Chelsey had done which I believe was of the mermaids from Peter Pan. I instantly fell in love with that piece and began browsing through her page. I noticed she had done tons of Disney tattoos, faceless ones being a popular one. She is a huge Disney fan and I loved that she clearly knew exactly what she was doing. She was so good at it too! Another major thing I noticed of her art that I loved was that she added dots "glitter" to her work which really pieces the whole tattoo together. It was something I hadn't seen any other artist do and I immediately knew I wanted/needed to get a tattoo by her. A Disney tattoo! I began to brain storm ideas of what I wanted to get done by Chelsey before I decided to message her. I kept thinking about something Alice but I already have a Alice tattoo and didn't want to get another one. I was highly considering the red head mermaid from Peter Pan since she is my favorite lol but chose not to. 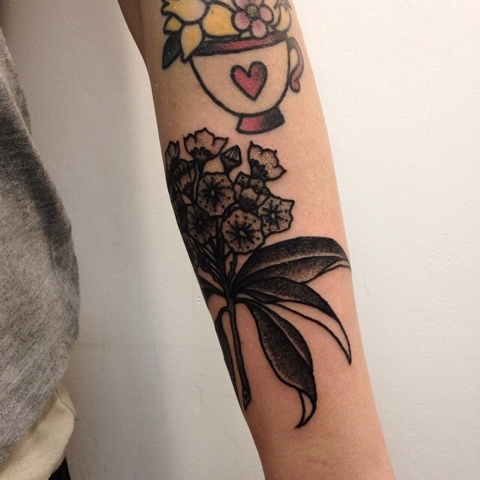 I stumbled across this photo above on Tumblr and fell in love with this tattoo of the tea cup and flowers inside of it. It reminded me so much of the tea cup from Mad Tea Party ride in Disneyland and that so happens to be my favorite tea cup. I'm not sure if that was what they were going for in this photo for the tattoo but I thought would be a great idea and perfect for Chelsey to do on me! I emailed her and she got back to me super quick and I made my appointment! I was so excited all her work is with such vibrant colors I was excited to see how mine would turn out. Once I arrived to the shop for my appointment she had me choose from two sketches. They both were with tea cup but one had more flowers than the other. I went with the one with more flowers of course and then she has me choose colors. You can really tell she knows exactly what she is doing because when she asked me to choose colors she had me choose colors on the opposite side of the color wheel so that everything can complement each other so well. I have never had a tattoo artist do this and I was very pleased with her already. What I loved most of her besides the fact that she reallyy knew what she was doing is that she gave me her honest input on things and I appreciate that from a tattoo artist. She did change the tea cup just a tiny bit, the original tea cup heart has gold but she asked if we could skip that and I was ok with it because I knew she would make it look the best she can. Of course once she was done I was blown away and I am still so obsessed with this piece till this day. It is one of my favorite tattoos I have had done and I got it on my right calf. The colors look amazing and still do today. 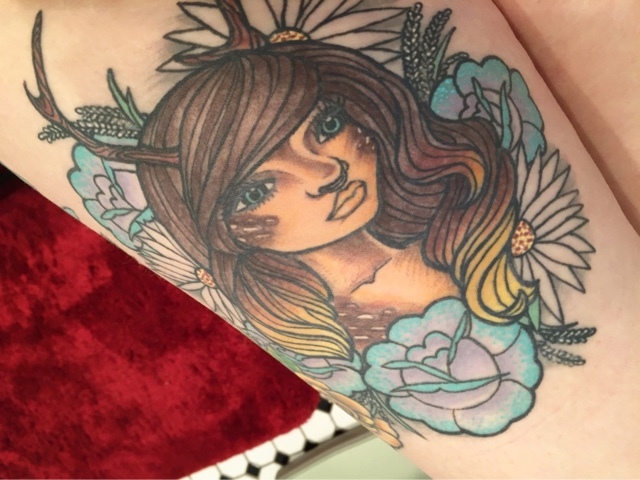 I love how detailed she is and I especially love how the dots came out on this tattoo. 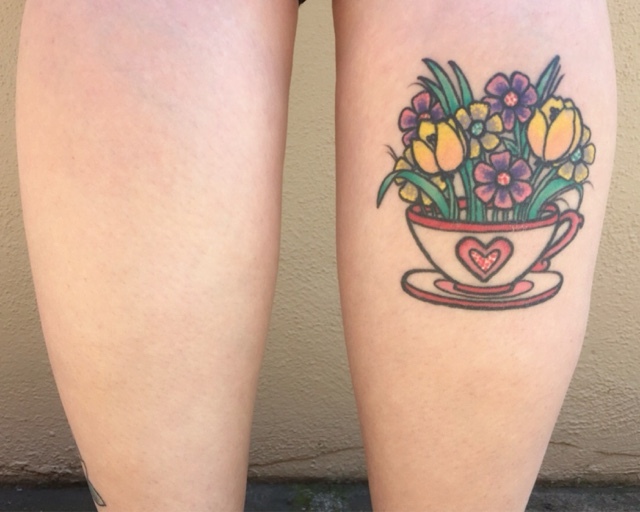 It is more than perfect my Disneyland tea cup with wild flowers inside and I'm excited for warm weather so I can show it off again. This spot was a bit tender and I remember it felt like it burned. This was also another tattoo I had to lay flat on my stomach so I was uncomfortable. I hate laying on my stomach ha ha. I knew I wanted to get more work done by Chelsey and the next piece she did was a big one! I had been wanting to add something to the front of my thigh for a while but never committed to getting anything done. I also had a few ideas but nothing every stuck. I love fawns I think they are so pretty and whimsical. I love the mixture between human and fawn/deer. Every year for Halloween it is a favorite look of mine to create. I told Chelsey about my idea and she was on board. When I saw her final sketch on this piece I was so excited to get started. It was everything I had envisioned and wanted, she brought it to life so perfectly. It took just about five hours or maybe more for her to complete this piece, keep in mind this is huge! We also did it all in one setting!!! I don't know how I did it but I did, I also used my trusty Hush gel for this. If it wasn't for that I know I wouldn't have stuck it through. It was only towards the end when the numbing wore off that the pain really hit me but honestly it was all worth it. I was so happy to have got it done all at once since I didn't have to wait any longer for her to be all done. I love how Chelsey added a septum piercing to her. I think it made my little fawn look so cool and look at her hair. Its ombré!!!!! A lot of people went crazy over that ha ha. I get tons of compliments on this piece as well I mean how can I not? She added flowers around her which I think just completed her. She added roses, babys breath and daisies. It's all so perfect I absolutely love her. Randomly Rudy and I were talking about getting matching tattoos. 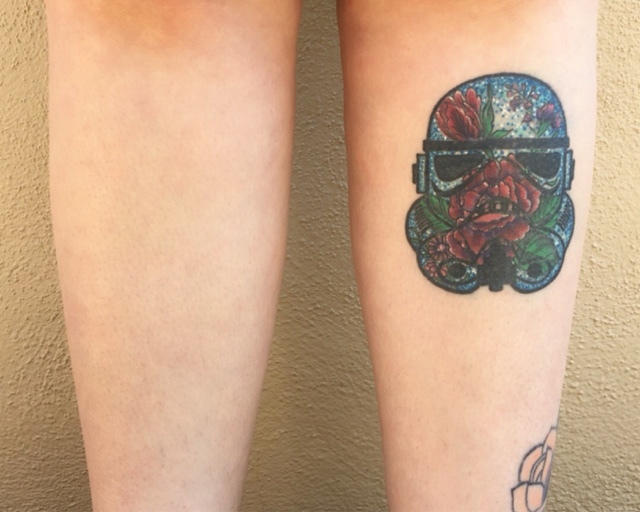 Rudy is a huge Star Wars fan and I know he had been wanting to get a light saber tattoo for a while. I thought why not get some what matching ones since I was becoming really obsessed with the series. Of course I had to have Chelsey do them since she is also a huge Star Wars fan, I knew she would know exactly what she was doing when it came to it. Rudy decided to do his red for the dark side and I wanted to throw a little unique touch to mine and have it be peach, of course ha ha. Rudy got his on the side of his hand while I got mine on the inside of my finger. This spot was very tender and pretty painful! Luckily its a small piece so it didn't last too long. 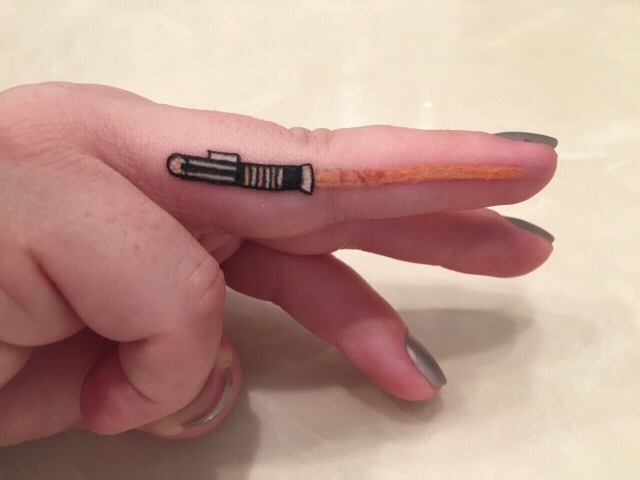 With it being a finger tattoo and the peach saber being so light in color I knew I would have to have it touched up a few times until the color really stuck. One really cool thing, Chelsey added glitter to my saber too! It gives such a uniqueness to it I love it! The very last tattoo I got was back in December. 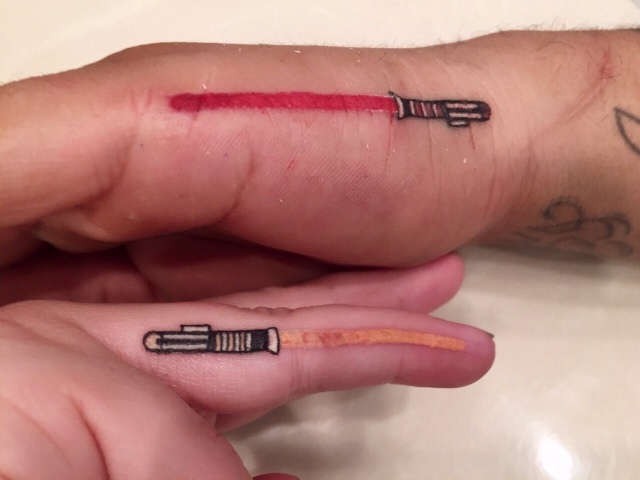 During this session Rudy and I had also got touch ups on our sabers. The Stormtroopers from Star Wars is one of my favorite characters. They are baé! I had been wanting to get them tattooed for a few months but didn't know how I wanted to do it. I had this pin that says Star Wars on it with a few roses in the back with a white background and that was what I really love about it. I don't know how I put the two together but since the Stormtrooper is while like the background of the pin I thought it would be really cool to have tons of flowers on the "helmet" of the troop. When I texted Chelsey about my idea she was excited about it like I was and when she showed me the sketch when I arrived for my appointment I was even more excited yet again. I decided I wanted to get him on my chin. I thought this spot was going to be very painful since every time I get hit on my chin its painful so to be safe I went ahead and used my Hush gel once again. How cool does this tattoo look??? I love it the colors, the flowers and the glitter everything! 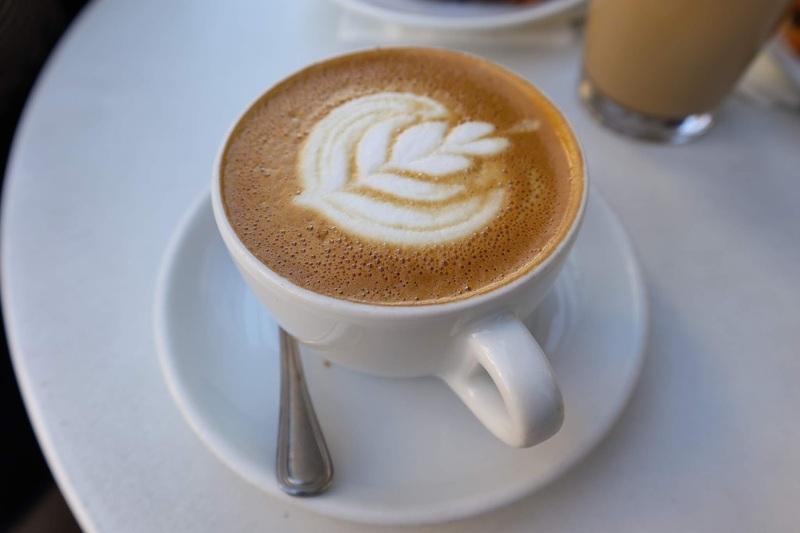 It looks so pretty. I especially love how it kinda reminds me of the galaxy on the top left of the helmet. Once I posted a photo of this piece on IG people were going crazy and loved it. 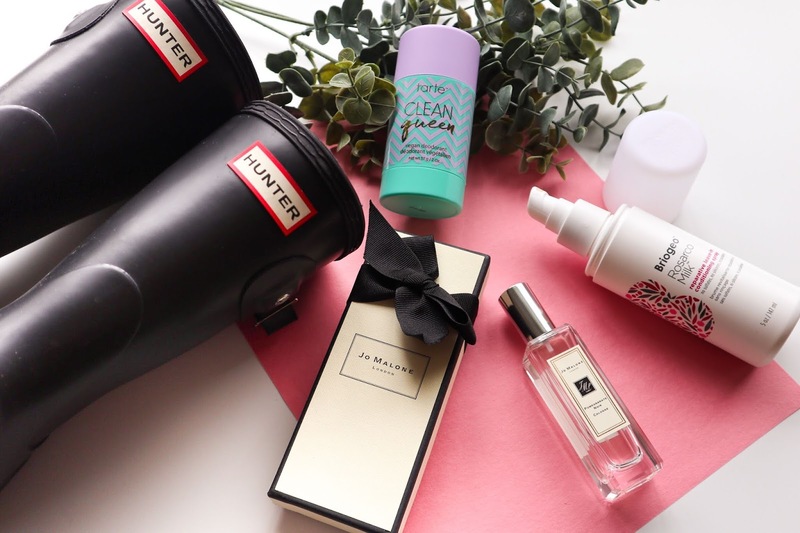 It is something so different and nothing I had ever seen anyone before me get. I am so happy I had Chelsey do this for me because like I've said before she really knows exactly what she is doing and Star Wars and Disney is what she knows so much about! I think she is such a perfectionist and I am very happy about it. I am more than satisfied with each and every piece she's done on me and I know I want her to do more on me. It's now been about 5 months since I got my last tattoo I haven't really been in any rush to get anything done lately. I suppose I've just been taking a break. I have however been thinking up of ideas of what I want to get next. My mind is always thinking of that next tattoo it's never ending. This is it for my tattoo series, I will make sure to share any tattoos I decide to get in the future. 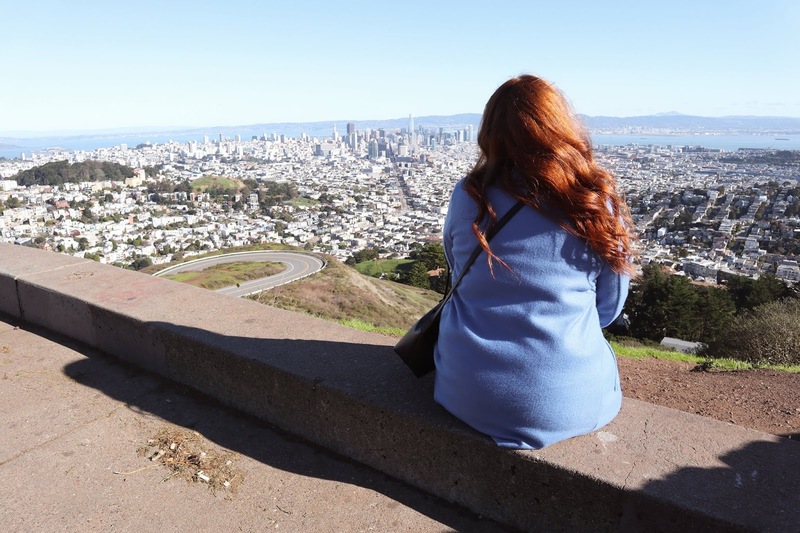 Also if you are in the Bay Area check out Chelsey you won't regret it! This was such a cute and sweet post, ugh I love Chelsey tattoos. I still want to get one done by her. She's awesome! I still need to get more stuff done by her.